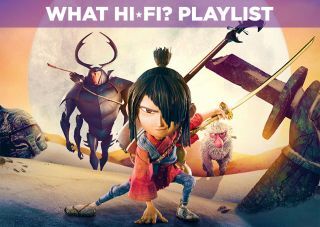 Kubo and the Two Strings – Blu-ray review | What Hi-Fi? Laika's Kubo and the Two Strings is a another outstanding feature animation from the stop motion studio. Laika Animation has established a great reputation, but it has never matched the box office success of Pixar or Dreamworks. It's a shame, as its latest film, Kubo and the Two Strings, deserves a bigger audience. The films follows Kubo (Art Parkinson), a one-eyed young boy who lives a quiet life by a shoreside village. Every day he tells stories to the villagers by magically manipulating origami with his shamisen (a Japanese guitar). Kubo's mother tells him that he has to return home before sundown, otherwise 'the Sisters' (both voiced by Rooney Mara) and the Moon King (Kubo's grandfather, voiced by Ralph Fiennes) will find him and steal his remaining eye (the other was taken as a baby). When he fails to return one day, he sure enough comes under attack. This sets in motion the main story, a quest to find three items – an unbreakable sword, a magical suit of armour and a helmet belonging to his late father, in order to defeat the Moon King. Tagging along are Monkey (Charlize Theron) and Beetle (Matthew McConaughey). Despite being an animated film, its tone is undeniably dark at times, with an impressive emotional depth to the main characters from the off. Fiennes’s Moon King may not have much screentime, but the story wisely keeps him as a threat in the background, and Mara's vocal performance for the Sisters gives them a sinister presence. Both Theron and McConaughey are great in their roles. Theron’s Monkey is a tough, no-nonsense, nurturing character who's the saner, more cautious of the two, while McConaughey’s Beetle gives him license to be fun, shifting from one pratfall to another. Together they form a surrogate family, complete with humorous bickering that brings humour to the proceedings in a way that feels natural to the story and the characters. There's plenty of entertaining, imaginative action, and it's all impressively realised, looking great in HD. Director Travis Knight and his animators deliver a film that’s vibrant and colourful, full of strong and soft colours alike. It's an excellent test for any TV’s colour palette. There’s detail to unearth too. Have a look at Kubo’s garments and how they differ from Beetle’s hard shell and Monkey’s fur, and you’ll appreciate the level of detail on display. Dialogue is clear, while Dario Marianelli’s playful score works well with the gentler moments while also adding excitement when required. Low-end frequencies will give your bass drivers a good workout, notably at the film’s climax, adding satisfying extra weight to the action on screen. Kubo certainly isn't perfect. The quest part of the narrative feels rushed towards the end, not quite delivering on the epic journey promise. And it's also perhaps a shame that for a film set in Japan, it's a mostly white voice cast. These quibbles aside, it’s another excellent Laika production and one that’s great entertainment for both children and grown-ups (despite the sometimes gloomy outlook). It may not have made as big a wave as Disney’s Zootropia or Moana from last year, but we think Kubo and the Two Strings deserves to be thought of in the same bracket. Watch it and enjoy.